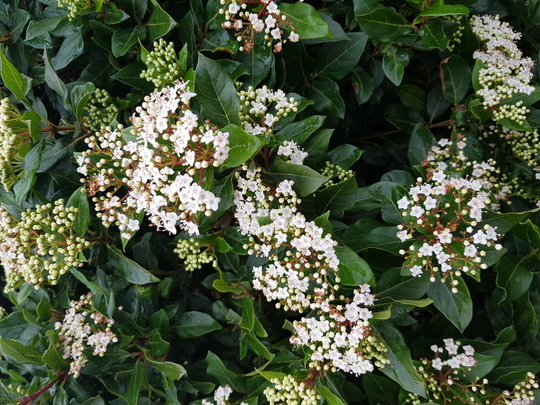 Viburnum shrub in my front garden, grown to around 7ft in height. Accompanied by laurel and osmanthus to form an “L” shaped hedge. Lovely white flowers in winter through to spring. Flowers followed by blue-black berries. Often little birds have nested in here over the years, which is nice. It's flowering beautifully Kate like the idea of the L shape hedge. Thanks Thrupennybit and Karen. I took this pic today, but when the weather improves, I’ll get out and take a pic of the full hedge. What a shame Karen, it’s the magpies we have to keep an eye on in our back garden. Yes the weather here has gone back to being very cold weather again forecast is artic weather after the wind storm. I shall look forward to seeing your hedge. See who else is growing Viburnum tinus (Laurustinus). See who else has plants in genus Viburnum.